Carbon nanotubes (CNTs) filled completely with polycrystalline Cu nanowires were synthesized by laser vaporization of Cu and graphite under high-pressure Ar gas atmosphere. 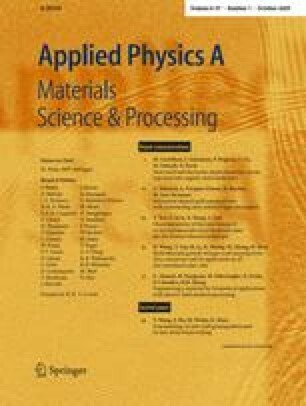 Depending on the Ar gas pressure (0.1–0.9 MPa) and the Cu content (1–40 at.%) in graphite targets for laser vaporization, various products with different morphologies were observed by scanning and transmission electron microscopy. The ratios of the Cu-filled CNTs and carbon nanocapsules particularly increased as Ar gas pressure was increased. The maximum ∼60% fraction of Cu-filled CNTs with outer diameter of 10–50 nm and length of 0.3–3 μm was achieved at 0.9 MPa from graphite containing 20 at.% Cu. Most of the encapsulated Cu-nanowires were surrounded by single, double, or triple graphitic layers. Although the yield of the Cu-filled CNTs was also dependent on the Cu content in the graphite targets, no unfilled CNTs were produced even for low Cu content. The growth of Cu-filled CNTs is explained by the formation of molten Cu–C composite particles with an unusually C-rich composition in a space confined by high-pressure Ar gas, followed by precipitating Cu and C from the particles and subjecting them to phase separation.